Buy this item and earn 76 ClubPoints. C2G's USB-C docking station with 4K HDMI, Ethernet, USB and power delivery is an ideal solution for audio/video, wired network connectivity and transferring data while in the office or on the road. 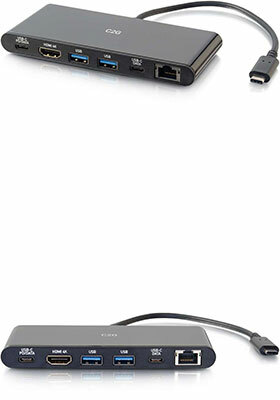 This docking station connects to a USB-C or Thunderbolt 3 enabled laptop, tablet, or desktop computer and features an Ethernet port and a USB Type-C port with power delivery. Connect to this docking station and display 4K HDMI audio/video content, while delivering power to ensure that a USB-C equipped laptop, tablet or smartphone is fully charged. Also transfer data with ease and speed, using the included USB-C data port or USB 3.0 ports that are backward compatible with USB 2.0. Overall, this docking station offers a light-weight, portable, and simple way to deliver video, transfer data, connect to a network and stay charged up. Supporting resolutions up to 4K (3840x2160 at 30Hz), the HDMI connection allows this docking station to mirror or extend a high quality video image to the connected display. Deliver up to 60W of charging power to the connected device. Transfer data up to 10Gbps using the USB-C port or 5Gbps while connected to the USB 3.0 ports. The Ethernet port allows for reliable internet connectivity with file transfer speeds up to 1000Mbps.